Some years ago Stephen Humphrey (the local studies librarian at Southwark Local Studies Library) noticed a report on the excavation of part of the bishop’s palace at Witney, Oxfordshire in The Times of August 23 1985. The drawing with its short piece of text that described it as showing Winchester House was amongst a collection of materials gathered together by Henry Laverock Phillips (1835-1917). He gathered large quantities of documents and other materials relating to Bermondsey into several scrapbooks, some of which survive in their entirety and others as loose materials. He frequently copied old illustrations and manuscripts, and did so in a style which is clearly identifiable. Most of his illustrations are copies of eighteenth and nineteenth century prints, or of early nineteenth century watercolours; many of the originals survive and can thus be compared for the precision with which Phillips made his copies. Amongst the manuscripts he copied were the parish registers and churchwardens’ accounts for Bermondsey and a cross-check between the originals and Phillips’ copies shows he was accurate in his transcripts. He seems also to have seen and copied other materials that have since been lost. That said, there are no grounds for thinking that he invented any of the material and such details as there are seem entirely plausible. 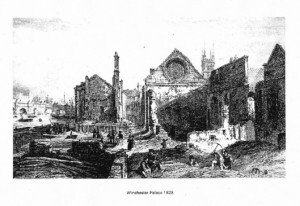 The drawing of a ruined palace was included by Phillips amongst his materials for Bermondsey probably because some of the monastic land was bought by Bishop Henry to add to that on which Bishop Giffard had previously built a London house, in Southwark, for the bishops – Winchester House. By the late 1980s it had become clear from Martha Carlin’s researches and Brian Yule’s excavations,  alongside a collection of drawings and prints that depicted Winchester House from the sixteenth century onwards, that the Phillips drawing was most unlikely to be of Winchester House. Given what we know of Phillips’s work and his scrupulous accuracy, it seems more than likely that the error of identification was made by the unknown artist who sketched these buildings in the first place. The sketch copied by Phillips is today a loose sheet that measures 11.9 inches by 6.9 inches (302 x 175 mm), the drawing of the buildings being 8.7 inches wide. The drawing itself is undated and bears no signature or other identifying mark, and is thus completely anonymous but a date of c.1790-1820 would seem to be appropriate. The draughtsmanship of the sketch is comparable to work by John Carter and Jacob Schnebbelie, both of whom worked in Hampshire in the late 1780s, though it is unlikely that the sketch was drawn by either of them as their work is, stylistically, somewhat different. The drawing shows in the foreground a stretch of walling linking what appears to be a pair of square towers. The style of the building work is clearly Romanesque, and it closely compares with the south frontage at Wolvesey palace, the bishops’ principal house and their home in Winchester. Set some way behind this Romanesque curtain is a range of buildings that belong to the later medieval period; details of the fenestration of these buildings suggesting they were still in use late in the fifteenth or early sixteenth centuries. Standing in the centre of this range of buildings is a structure that should most likely be identified as a hall. This has a steeply pitched roof and might indicate that this was roofed with slate, rather than with ceramic roof tiles. 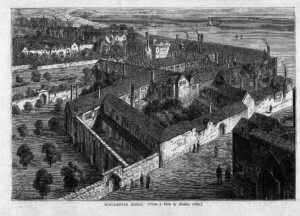 The building complex remained in use by the bishops of Winchester until 1642 when, by order of the Long Parliament the palace was converted into a prison and then in 1649 sold. The house was restored to the see in 1660 but was so damaged that the bishops transferred their residence to Chelsea. If the drawing does not show Winchester House and while there is some doubt about the authenticity of the text, it is nevertheless possible that the drawing does in fact depict one of the other houses that belonged to the bishops of Winchester, the problem now is to identify which one that might be. The six principal residences of the bishops in the twelfth century were the five castles and a palace listed in the Annales Monastici under the year 1138, as follows: a palatial house in Winchester (Wolvesey) and castles at Merdon, Farnham, Bishop’s Waltham, Downton and Taunton. This volume of monastic annals was compiled at Waverley Abbey (Surrey) towards the end of the twelfth century by Richard of Devizes, and while not strictly contemporary with the events they describe is nonetheless considered to be generally accurate. Archaeological evidence from Wolvesey, Farnham and Bishop’s Waltham shows that at all of these sites structures dating to the earlier twelfth century were probably in place before 1138. The vast earthworks at Merdon and Downton indicate a possibility that both of these castles also belong to the eleventh century, as may also the earliest phases at Farnham. The layout of surviving ranges of buildings at Farnham, Bishop’s Waltham and Taunton all indicate that the Southwark drawing could not illustrate any of these. At Farnham the great hall and kitchen form a long rectangular range that has at its centre the massive, brick-built Fox’s tower with, when viewed from the south, a backdrop formed by the towered shell keep. Bishop’s Waltham has a similar arrangement for hall and kitchen, but here a second range is set at right angles with a tower keep articulating the two main ranges. The now levelled keep at Taunton would have resembled those at Dover or Corfe, and had ranges of buildings lining the bailey with an external wet moat. The lack of any major earthworks or a moat shown in the drawing suggests it is unlikely that either Merdon or Downton is represented. This might conceivably leave Wolvesey palace, but here too the layout of the palace buildings cannot be matched with those shown in the drawing. 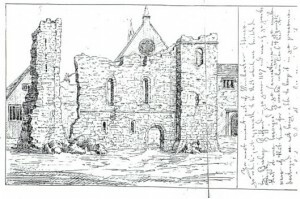 However, as noted above, there is a striking similarity between the building depicted in the Southwark drawing and the south face of the East Hall and Wymonds Tower at Wolvesey Palace, a particular characteristic aspect being the use of a decorative bullnose stringcourse, which at Wolvesey Martin Biddle dated to work of Period VI (c.1141-54). The general Romanesque character of the building shown in the Southwark drawing otherwise matches the slightly earlier phase, Period III, at Wolvesey which Biddle dated to c.1135-8. 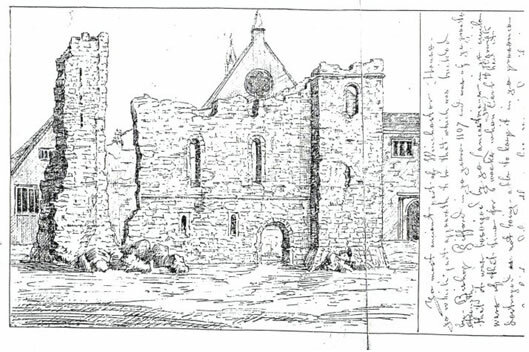 We can therefore probably assign a date of the mid-twelfth century to the Romanesque building shown in the Southwark drawing, and, given the similarity to the work at Wolvesey, it remains a possibility that it was one of the buildings erected for Henry de Blois. such as Merdon and Downton were included, whilst Witney was not. Indeed the only site which would seem to be an aberration in the list is Bishop’s Waltham, but even here there is some evidence for moated earthworks with stone built fortifications, though these were probably destroyed in 1155 when Henry II gave orders for Bishop Henry’s castles to be destroyed. The Southwark drawing would thus appear to show a building complex which had a semblance of fortification that would have been analogous to the bishop’s house at Witney, rather than the somewhat smaller residences such as that at East Meon. Two sites, both now completely destroyed, can be suggested as that depicted in the drawing: Bishop’s Sutton and Highclere. Details of the house at Highclere were included in the first of the bishops surviving manorial accounts, the pipe roll for 1208/9, whilst the land itself had been held by the bishops from before Domesday. The Highclere estate lay astride the main north-south route from Winchester to Oxford and, more significantly, during the warfare of the Anarchy the estate marked the frontier zone between the adherents of King Stephen – for whom Bishop Henry was a leading supporter – while to the north the lands was held by Brien fitzCount and John fitzGilbert. The strategic setting of Highclere during this period would substantiate the possibility that had there been an episcopal residence of any size here, then it is highly probable that it would have been fortified. The episcopal palace at Highclere is partially overlain by the present Highclere Castle and nothing is now known of the layout of the earlier bishop’s palace. The episcopal house at Bishop’s Sutton is in one crucial respect better documented – a charter records that the site was actually obtained by Henry de Blois. The manor was granted to him in exchange for the manor of Steeple Morden (Cambridgeshire) by King Stephen in 1136; the transaction being mutually convenient, as Steeple Morden was added to the king’s own lands. The only surviving trace of the site is a rectangle of ground measuring some 95 metres by 85 metres within the remaining traces of a moat. John Duthy writing in the early nineteenth century and citing eye witness, accounts noted that there had been the remains of extensive buildings on the site until late in the eighteenth century but that these had all been removed before he saw the site for himself. Duthy further noted that the site had been used as a defensive position during the skirmishes leading up to the battle of Cheriton (1644), and that the episcopal manor house was destroyed as a result. However, until someone undertakes a resistivity survey on the site, or a sufficiently hot and dry summer produces ‘scorch’ marks that might reveal the layout of the walls of this site, it is not possible to do anything other than suggest Bishop’s Sutton might be the building shown in the Southwark drawing, although that said, the palace at Highclere is as good a candidate for this now lost palace of the bishops of Winchester. Allen, T. G., and Hiller, J. The Excavation of a Medieval Manor House of the Bishops of Winchester at Mount House, Witney, Oxfordshire (Oxford Archaeology, 2002). Biddle, M. Winchester in the Early Middle Ages (Oxford, 1976). ——, Wolvesey. The Old Bishop’s Palace, Winchester (London, 1986). Carlin, M. ‘The Reconstruction of Winchester House, Southwark’, London Topographical Record (1995), 25, 33-57. Davis, R. H C. Regesta Regum Anglo-Normannorum 1066-1154, Vol III (Oxford, 1968). Dunlop, G. C. Pages from the History of Highclere, (Oxford, 1940). Duthy, J. Sketches of Hampshire (Winchester, 1839). Franklin, M. J., English Epicopal Acta. 8, Winchester, 1070-1204 (Oxford, 1993). Luard, H. R. ‘Annales de Monasterii de Wintonia’ in Annales Monastici, Vol II (London, 1865). Riall, N. ‘Hampshire in the Anarchy of 1142-1153: the role of Bishop Henry of Blois’, Hatcher Review (1994), 4/37, 14-26. ——, ‘The New Castles of Henry de Blois as Bishop of Winchester: The Case against Farnham, Surrey’, Medieval Archaeology (2003), 47, 115-29. Schadla-Hall, R. T. The Winchester District: The Archaeological Potential (Winchester, 1977). On the excavations at Witney, see Allen and Hiller 2002. Carlin 1985, 33-57 ; Yule pers.comm. Annales Monastici in Annales de Monasterii de Wintonia, II, ed H. R. Luard, 1865, 51. For a discussion of this annal and its historical accuracy, see Riall 2003, 115-29. Pipe Roll 2 Henry II, p. 54; and see Biddle 1974, 326 n. 5; Riall 2003, 121. On Highclere, see Dunlop 1940. Details of the involvement of Hampshire in the warfare of the Anarchy (1142-53) are given in Riall 1994. Regesta 3, charter 944; and see Franklin 1993, actum 108.